My all time favorite dessert is Mango and Sticky Rice. It’s a Thai treasure, but the key is to use a perfectly ripe Mango. Unfortunately my craving could come at no worse time of year. 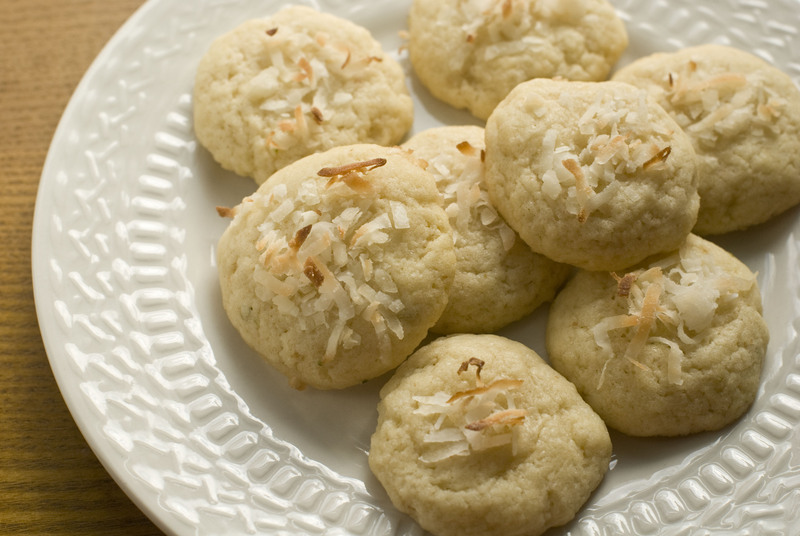 We’re between seasons for most Mango varieties, but I used coconut milk to make these tropical-inspired sugar cookies. 1: Preheat oven to 375°F. 2: In a large bowl, sift together flour and baking powder. 3: In a medium bowl, blend coconut oil and sugar. Add coconut milk and vanilla. Mix well. 4: Combine wet ingredients with the dry until well incorporated. Fold in lime zest. 5: Spoon out about 1 Tablespoon of dough, roll into a walnut-sized ball and place on an ungreased cookie sheet. Flatted ball slightly and top with shredded coconut. Repeat. Bake 8-10 minutes or just until cookies become golden on the bottoms.